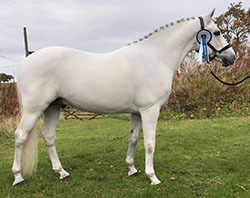 Sire: Sire: Coral Ross is a Class One Connemara stallion out of Bibi, who is a prolific performance broodmare who has produced 3 Class One stallion sons. 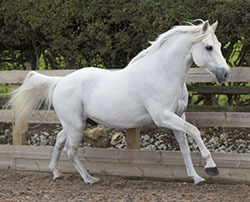 Coral Ross himself has sired four Class One approved stallions all of whom have their own stock now representing the breed internationally as performance ponies, many of which have topped the gelding sale prices in Ireland. Dam: Annagh is a Class One Connemara mare who, as a foal, won 17 first prizes, retiring a Champion as she was never shown again. 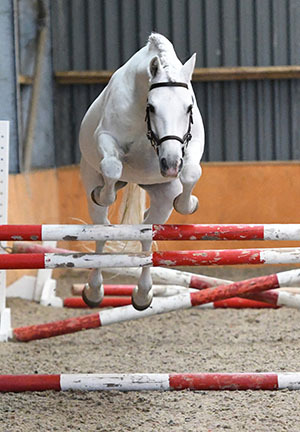 She then went on to breed several exceptional performance mares and stallions, most noticeably Dohulla Sandy who is now showjumping in Sweden. Damsire: Robin Hood, who can been found in the back breeding of a great number of top performance ponies but is now seldom seen in the first or second generation, is at the forefront of Ross’ bloodlines. Known as “the great Robin Hood from Annaghdown”, he is out of the legendary mare Village Grey, one of the first of the Village line she was the dam of 7 Class One stallions who carry on this valued and sought after line. Robin Hood is also the damsire of the very successful 138cm jumping pony Grey Palace, 3rd at HOYS at the age of 21. 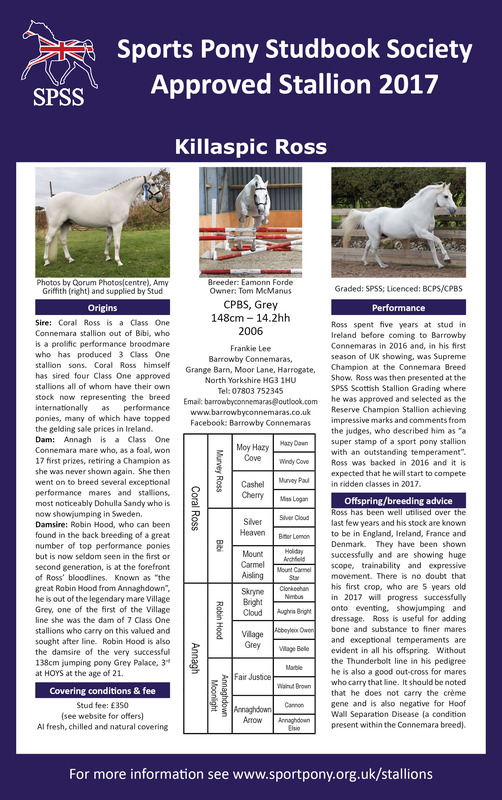 Ross spent five years at stud in Ireland before coming to Barrowby Connemaras in 2016 and, in his first season of UK showing, was Supreme Champion at the Connemara Breed Show. Ross was then presented at the SPSS Scottish Stallion Grading where he was approved and selected as the Reserve Champion Stallion achieving impressive marks and comments from the judges, who described him as “a super stamp of a sport pony stallion with an outstanding temperament”. Ross was backed in 2016 and it is expected that he will start to compete in ridden classes in 2017. Ross has been well utilised over the last few years and his stock are known to be in England, Ireland, France and Denmark. They have been shown successfully and are showing huge scope, trainability and expressive movement. There is no doubt that his first crop, who are 5 years old in 2017 will progress successfully onto eventing, showjumping and dressage.